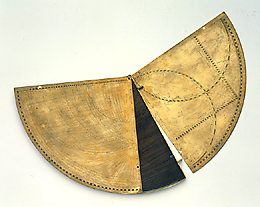 The instrument is a double quadrant, made up of two brass plates between which is a wooden table of the same shape, kept together by pivots. The three plates rotate on top of each other about a single pivot placed at the right angle. By using the markings on the faces of the quadrants it is possible to make trigonometric operations, to measure elevation, to calculate the moveable feasts and to make astrological predictions. The symbol 'II', representing the sign Gemini, reveals the author to be Thomas Gemini, a maker of observational and measuring instruments.